When his picture appeared on the cover of Texas Monthly, Joaquin Jackson became the icon of the modern Texas Rangers. Nick Nolte modeled his character in the movie Extreme Prejudice on Jackson, and Jackson even had a speaking part of his own in The Good Old Boys with Tommy Lee Jones. But the role that Jackson has always played the best is that of the man who wears the silver badge cut from a Mexican cinco peso coin, a working Texas Ranger. Legend says that one Ranger is all it takes to put down lawlessness and restore the peace—one riot, one Ranger. 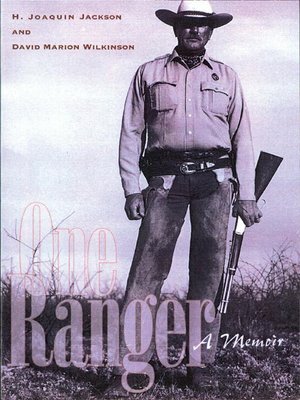 In this adventure-filled memoir, Joaquin Jackson recalls what it was like to be the Ranger who responded when riots threatened, violence erupted, and criminals needed to be brought to justice across a wide swath of the Texas–Mexico border from 1966 to 1993. David Marion Wilkinson is an award-winning writer whose most recent books are Oblivion's Altar, The Empty Quarter, and Not between Brothers. H. Joaquin Jackson retired from the Texas Rangers in 1993. Today he lives in Alpine, Texas, where he is the owner and operator of Ranger Investigations, a private investigative company.